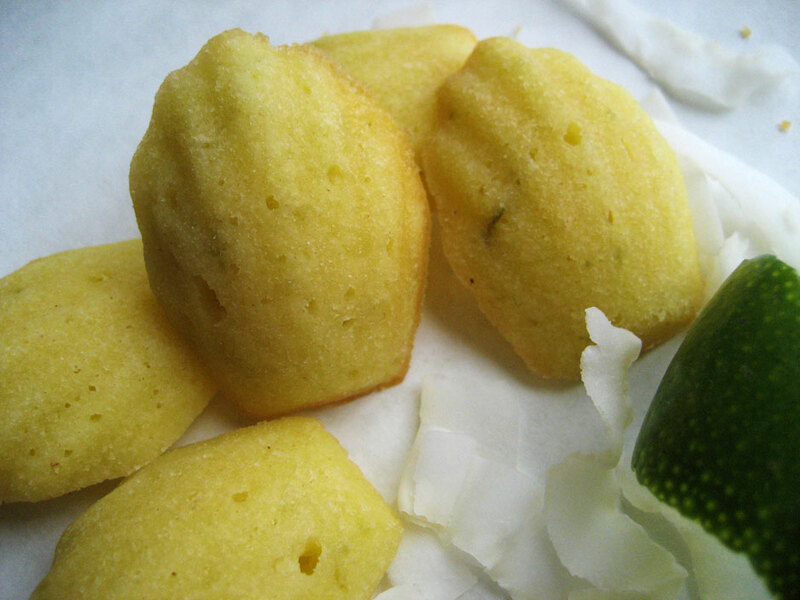 I really love making madeleines. 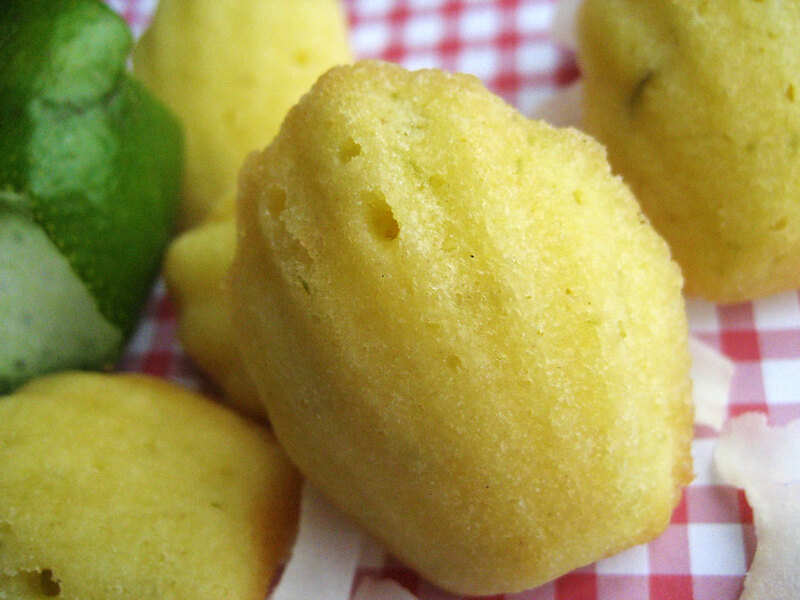 They’re absolutely adorable all tiny and scallopy from my mini madeleine pan. I was extra excited when I got my coconut oil from Tropical Traditions because it would be a perfect addition to madeleines, I figured. It's not a madeleine without a nice little lump on the back. Initially I planned an infusion of lemongrass to go with the coconut, and thought I’d try replacing half of the flour in the recipe with some rice flour I’ve had sitting around for a while, for an exotic, slightly Asian twist. However, I found out a few days ago that one of my favorite food blogs, Coconut & Lime, is having its fifth blogiversary this month. To celebrate this momentous and totally admirable occasion (seriously, she’s been making up her own completely original recipes for FIVE YEARS), Rachel is holding a contest in which participants can make one of her recipes, or make up their own recipe containing coconut and lime. Well, that there looks like coconut. It was an easy sub to replace the lemongrass with a zested and juiced lime. 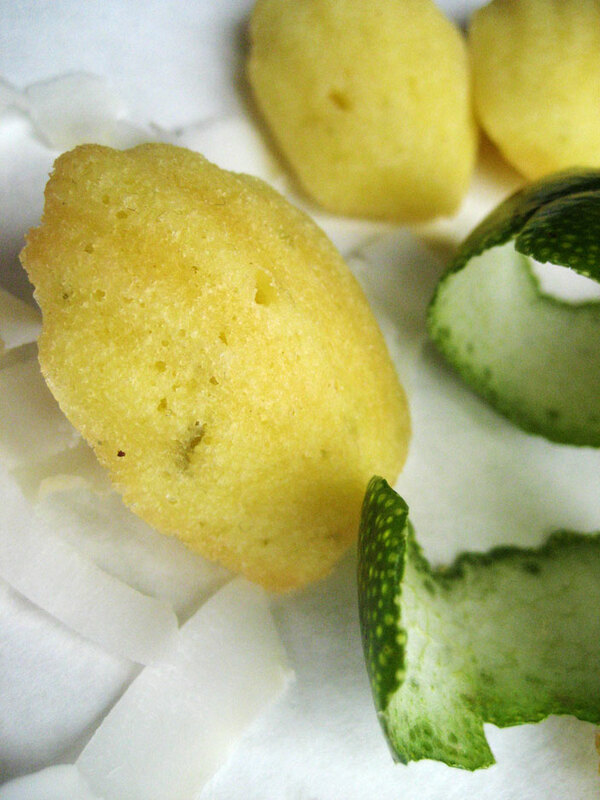 These smelled AMAZING while baking – very refreshing and tropical. 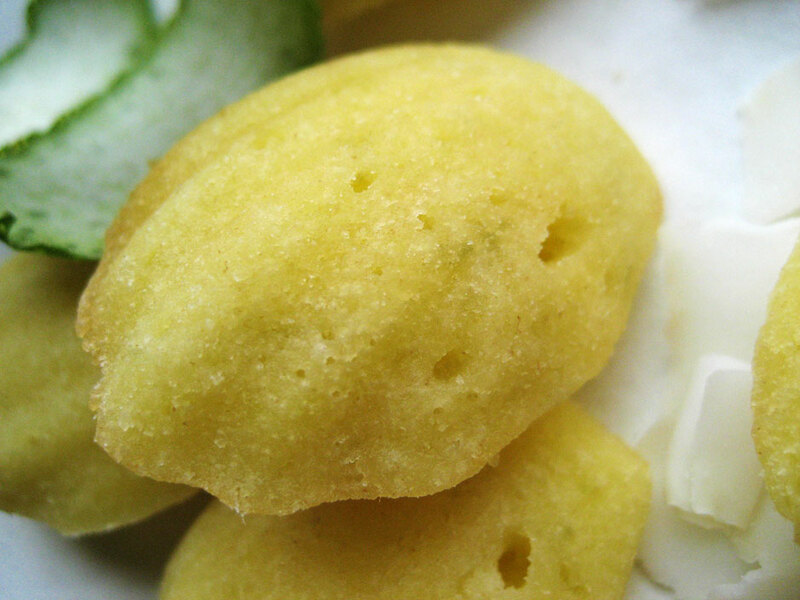 They taste wonderful, as all madeleines do, either fresh out of the oven (when they’re still crispy around the edges) or at room temperature with a corresponding tea. These go well with coconut and ginger teas, but would also work well with grassier, more citrusy green teas. I chose to only replace half of the melted butter with coconut oil and half of the flour with rice flour, so as not to mes with the alchemy of baking so much. They don’t suffer at all from the substitutions, and the coconut flavor is definitely there. All coconut oil might actually be overwhelming. So much fun to make! Melt the butter gently in a small saucepan or in a microwave-safe bowl. When it is almost completely melted, remove from heat and stir in the coconut oil, continuing to stir gently until completely melted. Set aside to cool, stirring occasionally to prevent separation. Meanwhile, whisk together the flours, baking powder and salt. Set aside. In a stand mixer fitted with the paddle attachment, beat the eggs and sugar on medium-high for about 5 minutes, until fluffy and nearly triple in volume. Quickly beat in the lime. Sift a small amount of the flour mixture into the eggs. Gently fold it in, then repeat in small batches with the rest of the flour. Once it is fully incorporated, plop about 1 Tbsp of it into the melted fats. Whisk it in to lighten, then incorporate the butter mixture by thirds into the batter, folding it completely and gently. Cover the bowl with plastic wrap and place in the fridge for at least 30 minutes. Preheat the oven to 375. If using a nonstick pan, lightly butter the scallops; otherwise, thoroughly butter and flour them. If using a regular-sized pan, scoop by neat Tbsp into the middle of each indentation; if using a mini pan, scoop by scant tsp. 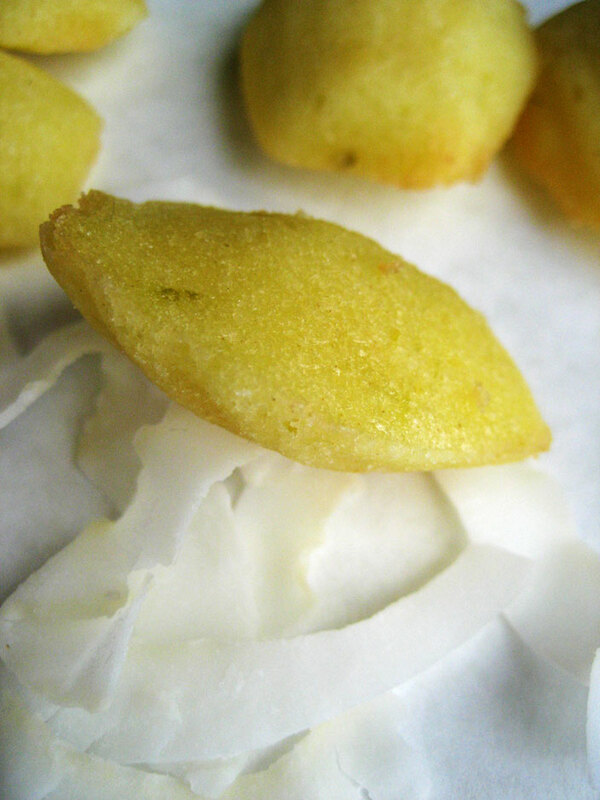 Bake for around 15 minutes for regular and 10 minutes for miniature madeleines, until lightly golden brown around the edges (they will also be springy when poked). 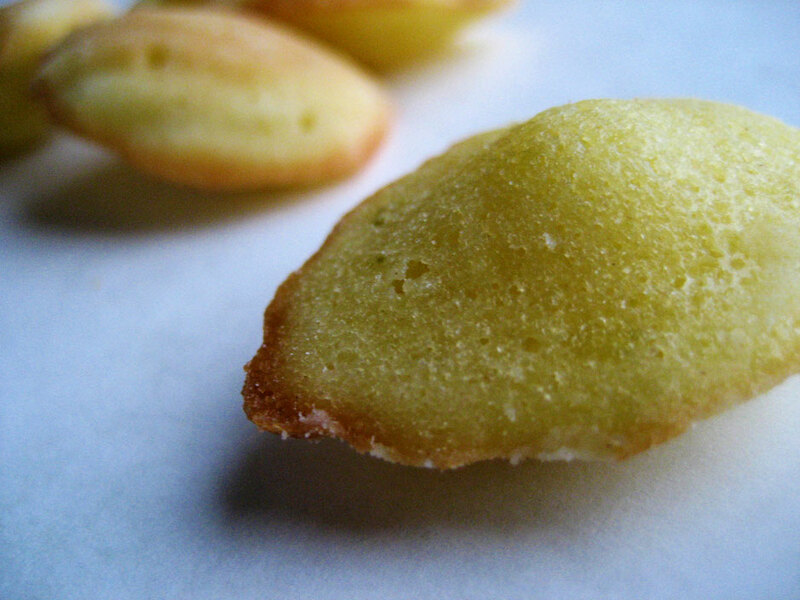 Immediately after removing from the oven, rap the pan sharply against the counter and turn the madeleines out onto a cooling rack. Sometimes you have to use your finger to poke them out. I’m really digging this coconut oil. It has a lot of neat baking applications, as it clearly can not only replace other oils, but melted butter as well. Hey Anna! Thank you for visiting my blog! :) what a cute space u got here!!! 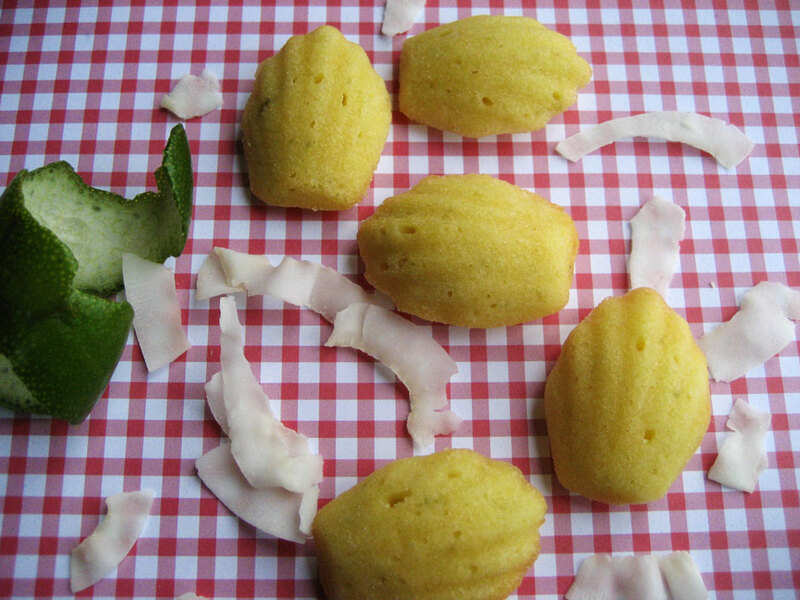 Great combination of flavors to give a kick to the traditional madeleines. 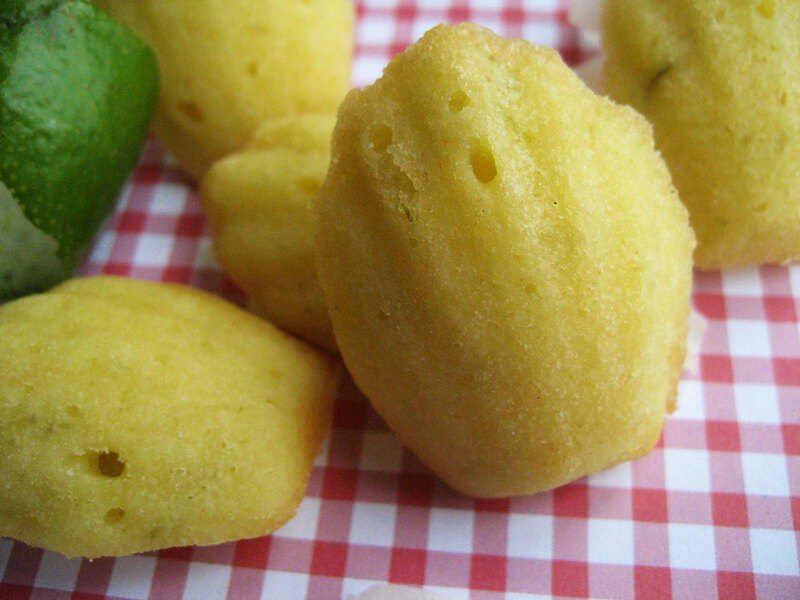 Cutest madeleines ever. Nice! Coconut and lime are perfect together; Nilsson knew exactly what he was talking about!